FORMER vice-president Joice Mujuru yesterday urged people to register to vote in their millions to prevent the creation of a Mugabe dynasty, saying Zimbabweans do not deserve the untold suffering they endure on a daily basis because of Zanu PF’s misrule. 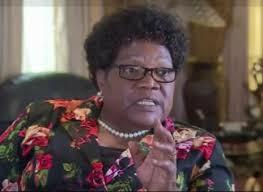 Mujuru, who fronts the National People’s Party (NPP), said she humbly accepted the People’s Rainbow Coalition (PRC) nomination to stand as its presidential candidate against President Robert Mugabe, before expressing confidence of electoral victory in the 2018 polls. The former VP made the remarks during the unveiling of the PRC at Stanley Square in Makokoba high-density suburb in Bulawayo. The PRC brings together the breakaway People’s Democratic Party led by Lucia Matibenga, Zimbabweans United for Democracy led by Farai Mbira and the Democratic Assembly for Reform and Empowerment whose leader is Gilbert Dzikiti. The parties also signed their coalition agreement yesterday. “Our signing ceremony signifies a milestone journey for the coalition as we prepare for the 2018 elections,” Mujuru told the crowd. Dzikiti weighed in, saying “Zimbabwe does not belong to any other person but all Zimbabweans. Fears abound Mugabe is pushing for a dynasty following calls by his Zanu PF structures to elevate first lady Grace to the vice-president’s post with a view of choosing her as his successor. According to the PRC agreement, Mujuru is the presidential candidate while parliamentary, senatorial and council candidates will be chosen by members of all the four parties in the respective areas, through primary elections where necessary. Mujuru said the PRC frowned upon Zanu PF’s “one centre of power” policy, which she condemned for cultivating a dictatorship and sowing seeds of poverty among Zimbabweans. “On October 20, I was humbled by the PRC nomination as the parties’ presidential candidate for the 2018 elections,” she said. “It is a responsibility that I will not take lightly. The leadership that the PRC is striving for is people-centred. “We reject the one centre of power; we should not entertain that as the PRC. Matibenga called on ex-combatants to close ranks with opposition parties to fight Zanu PF and ensure what they fought for during the liberation struggle was fulfilled when the ruling party is out of power. “It is important for us to acknowledge these women and men [war veterans] for what they have done to liberate this country,” she said.